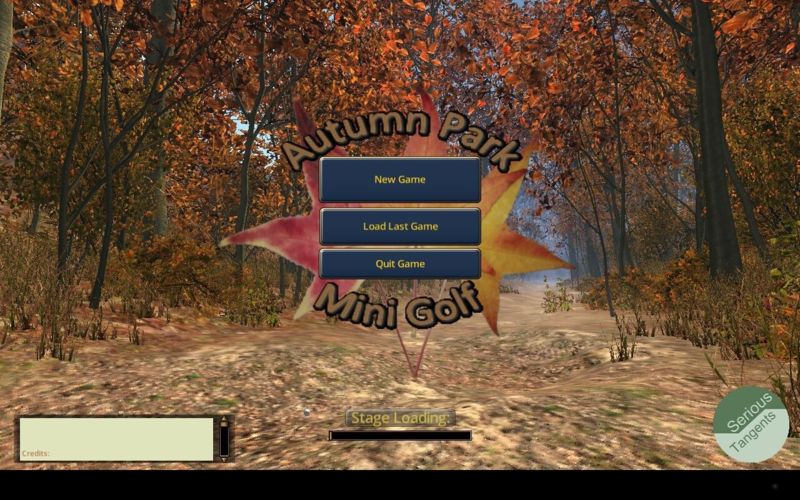 Autumn Park Mini Golf is a new game developed by Serious Tangents. Available for Android, our Miniature Golf game creates a relaxing atmosphere that blends well with the smooth jazz and piano sets. Easy to learn, but challenging to master. Can you make 18 holes under par? We made the park a place you'd want to visit and spend your time in. Can you find all the wildlife? Only the first hole is a Par 2. There are plenty of Par 5s and Par 6 courses to keep you challenged. Listen to a nice, long soundtrack of jazz, both guitar and piano, interspersed with bird songs. What good is a beautiful environment if you cannot explore it? Take your time and wander around. The next hole will be waiting for you when you are ready. Rewards are given depending on how well you finish the game. "What really caught me about APMG is the scenery. Everything fit together very nicely and it was a very graphically appealing game in that sense. The idea of walking to the hole yourself instead of being placed in a pre-programmed spot is also something that is appreciated, and unique!" "I like it! Music is nice and soothing, graphics look great, and it's easy enough to figure out how to play." "I'm surprised at how smoothly it runs on the phone for being such a large app." We're currently on the Steam Greenlight Program. Never heard of it? It's a program where indie developers can get their game hosted if they get enough approval votes. You can vote for this game here.